Monday, June 8–Accompanying Kryssy on her visit to Radio Active, a local radio station, was of particular interest to me because of my work with Stony Brook’s WUSB “News at Noon” show. I wanted to take a peek into college news production in India to compare it to my experience in New York. The studio at Jain University’s Palace Road campus was pretty much identical to WUSB’s: a small room equipped with a desk, a microphone and a sound controller. 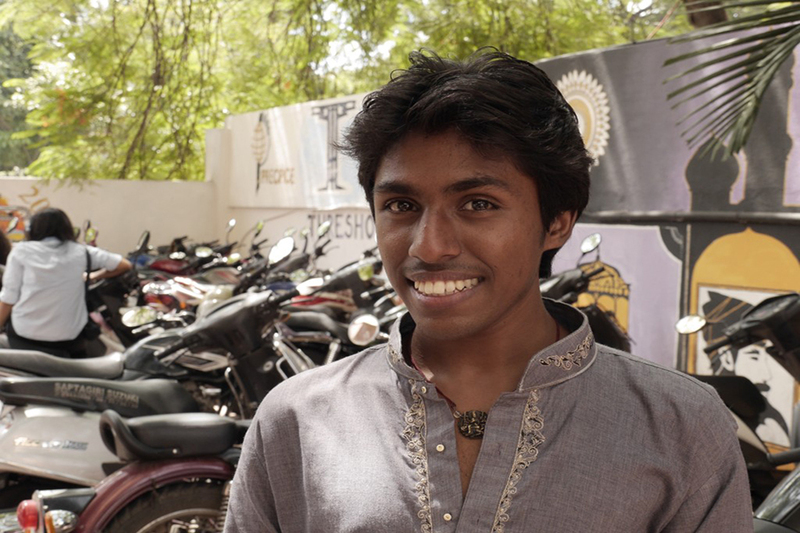 We met Shilok Gowda, a student at the university who hosts a show on LGBT issues in India. Shilok was born male but identifies psychologically and emotionally as a female. He dresses as a man and said he would not undergo reconstructive surgery to change his appearance because “God gave me this body.” His voice is naturally high-pitched and soft. Sitting down with him (he assured us he was comfortable being described by either pronoun) was compelling because we got to see him not only as an important young figure in the LGBT community but also as a thriving radio personality whose voice resonates with hundreds of students learning to deal with gender identity and sexuality. In an hour-long interview, Shilok described his struggle growing up in a remote village where gayness was never mentioned, much less understood. He recalled never having heard of transgendered people until he was in 12th grade and attending a pre-university program. After poring through books and religious works, he stumbled upon the concept and realized that he was not alone in feeling as though his biological makeup did not match his emotional makeup. He felt that he was a woman trapped in a man’s body, a woman who was attracted to men. His teenage years were tumultuous. He suffered through sexual harassment at the hands of his peers, and constant bullying, even by teachers who found it strange that he had the voice of a girl in a man’s body. Particularly heart-wrenching was his story of how a professor humiliated him during class after he read aloud from a lesson book. The professor said that his voice resembled those of the transgenders who begged for money near the tollbooths in Bangalore. Shilok said that moment was pivotal for him, causing him to question his very existence. He wanted to disappear from the world. This entry was posted in Blog and tagged Bangalore, Jain University, JWWIndia, LGBT/India, Radio Active, Shilok Gowda, transgender. Bookmark the permalink.